Pisey graduates from the Sala Bai Hotel Training School. Young Cambodians with disabilities face an uphill struggle to earn a living wage, gain their independence and become empowered members of society. It is hard to get ahead in life if you are marginalized and denied the critical educational and training opportunities others can access more easily. Twenty-three year-old Pisey from Kampong Chan province was one such person until he got a life-changing opportunity from the Krousar Thmey foundation. This Cambodian aid organization provides unique educational prospects for deaf or blind children. Pisey entered the Krousar Thmey School for blind or deaf children in Kampong Cham in 2004 at the age of 12. He started his learning by spending four years in the foundation’s special school where he learned how to communicate through the sign language. 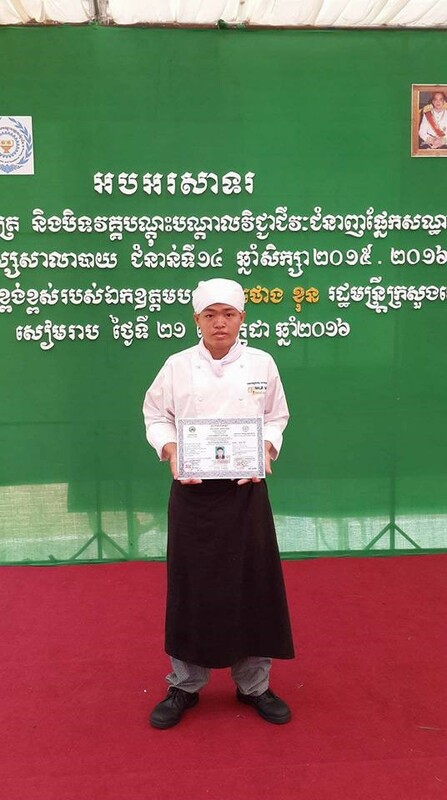 He was also taught the Khmer alphabet, how to read Khmer texts and basic mathematics as part of the official curriculum enacted by the Ministry of Education, Youth and Sport. This enabled Pisey to attain the same educational level as children without disabilities who had been taught exclusively in public schools. During the fifth year of his instruction, Pisey transferred to the public school system and to maintain his progress he attended extra classes at Krousar Thmey. This enabled him to pass the national exam after Grade 9 and continue his studies until Grade 10. At the end of his first year in high school, a career counsellor met Pisey to discuss the next course of action. As he was almost 23 years-old at the time, entering university did not seem the best option as a bachelor degree requires at least four additional years of study after Grade 12, so the two explored vocational training as a more viable option. This led to a catering placement with the Sala Bai Hotel Training School in Siem Reap – a long-term partner organization of Krousar Thmey. This placement is highly significant as Pisey – along with two friends – is among the first deaf apprentices to be inducted onto Sala Bai’s training scheme. Krousar Thmey helped with his instruction, primarily in cooking, through the provision of a sign language translator. During his training, Pisey attended practical lessons in the morning and theoretical lessons in the afternoon with a focus on cooking, management, and English language skills. The integration of the three deaf youths onto the course is considered a great success. Pisey and his two friends – Sophearom and Visal who undertook training in housekeeping –have all successfully adapted to a new environment and met their daily challenges with ease. Pisey’s professional development continued with a second term of internship at the renowned Cuisine Wat Damnak restaurant in Siem Reap. This has equipped him with exceptional practical skills in the competitive catering sector that will stay with him for the rest of his career. Sala Bai’s policy of mixing deaf students with hearing students during training activities has also raised Pisey’s personal development to a new level. He now integrates with the wider “hearing” community with confidence. Some of his close student friends learnt the sign language to overcome communication barriers. With successful graduation from his course, Pisey has achieved landmark achievements in his life. He has gained independence from his immediate family; he has adapted to a new environment of learning; and he has become a confident individual who has overcome a disability and entered the fast paced world of employment. This is testament to the success of Krousar Thmey’s Academic and Career Counselling (ACC) programme for deaf and blind students – a project that has been operational since 2010. Since October 2015, UNICEF has provided financial support for ACC activities, including individual counselling, orientation workshops, university and company visits and awareness raising workshops for universities and employers. *The author, Colin Rehel, is a staff member of the Krousar Thmey Foundation.